Shipped at 4°C. Store at 4°C (stable for up to 12 months). Our Abpromise guarantee covers the use of ab106579 in the following tested applications. WB Use a concentration of 1 - 2 µg/ml. Predicted molecular weight: 97 kDa. Acts as a transcription activator for MET and as a key regulator of HGF-MET signaling. Promotes cell motility, proliferation and hepatocyte growth factor (HGF)-dependent scattering in vitro and tumor growth and metastasis in vivo. Preferentially expressed in metastasizing tumors. Cytoplasm. Nucleus. Mainly found in the cytoplasm in non-metastasizing tumors. 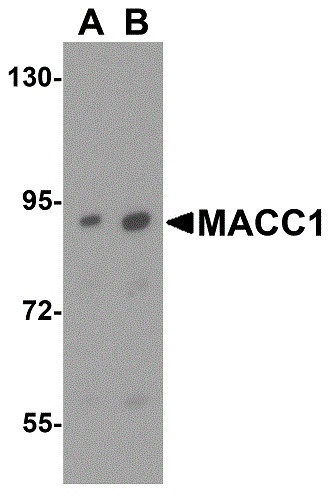 Western blot analysis of MACC1 expression in human liver tissue lysate with ab106579 at (A) 1 and (B) 2µg/ml. Immunohistochemical analysis of MACC1 expression in paraffin embedded Human liver tissue, using ab106579 at 2.5 µg/ml. 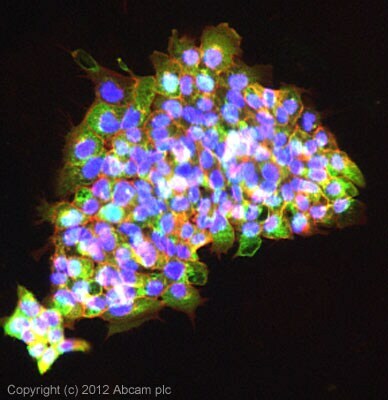 ICC/IF image of ab106579 stained A431 cells. The cells were 100% methanol fixed (5 min) and then incubated in 1%BSA / 10% normal goat serum / 0.3M glycine in 0.1% PBS-Tween for 1h to permeabilise the cells and block non-specific protein-protein interactions. The cells were then incubated with the antibody (ab106579, 5µg/ml) overnight at +4°C. The secondary antibody (green) was ab96899, DyLight® 488 goat anti-rabbit IgG (H+L) used at a 1/250 dilution for 1h. Alexa Fluor® 594 WGA was used to label plasma membranes (red) at a 1/200 dilution for 1h. DAPI was used to stain the cell nuclei (blue) at a concentration of 1.43µM. 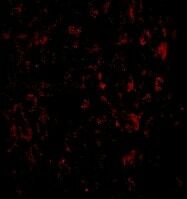 Immunofluorescence of MACC1 in Human Liver cells using ab106579 at 20 ug/ml. Thank you for contacting us. Your credit note ID is 18744. I am sorry that this antibody did not perform as stated on the datasheet. I have asked our accounting department to issue a credit note for you, which can be redeemed against the invoice of a future order by passing it on to your purchasing department. To avoid confusion, please ensure your accounts department is aware of how the credit note is being used. If you have questions on how to use the credit note, please contact our accounting department. 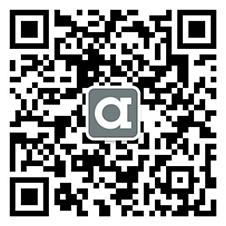 Our accounting department can be contacted by email at us.credits@abcam.com or by telephone using the information at the Contact Us link in the top right corner of our website. Please refer to the credit note ID in any correspondence with our accounting department. The credit note ID is for your reference only and does not automatically guarantee the credit. I hope this experience will not prevent you from purchasing other products from us in the future. Our Scientific Support team is always at your service, should you require further expert advice.